Guest or Patient System including our CS6 Pagers Complete! Apply for our Guest or Patient complete Paging System with pagers, transmitter (T9560MT) with all cables and chargers complete with a 3 year warranty. And this system is using LRS newest CS6 technology direct from the manufacturers office. All offers are available within the specified time limit as applied on our websites. You can buy as many systems as you need. 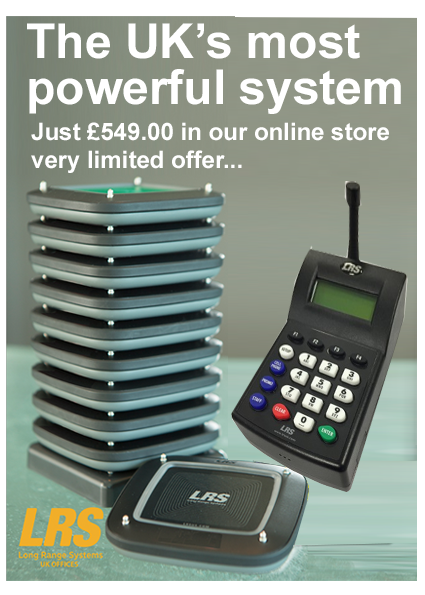 Extra guest pagers (also low cost) and with a 3 year warranty! Long Range Systems UK Ltd is celebrating in January 2019 30 years in business! To celebrate this achievement we are going to be showing why LRS products are the best in the world... and we're offering very special pricing so please do contact us directly or speak to one of our dealers.